Home // Biblical Principles // What’s the Next Step? Many of the words the Bible uses to describe what it means to be a disciple of Jesus imply movement. Consider the call that Jesus extended to his first disciples. He often said: “Follow me.” To be his disciple meant leaving where you were and going with him. It’s no wonder then that life in Christ is often described in the remainder of the New Testament as a “walk.” The Apostle Paul would write: “Therefore, as you received Christ Jesus the Lord, so walk in him” (Colossians 2:6, ESV). Or consider how the book of Acts describes early disciples. They are called people who belonged to “the Way.” To be on “the way” certainly means that you are on a journey—a journey with Christ. So, what does the next step in your journey look like? Do you know what it is? Are you willing, by faith, to take the next step? Here are a few diagnostic questions that might help. Have you repented, believed, and been baptized? This is the way the Bible says we should respond to the gospel. Have you become a member? Every follower of Christ should be a member of his body, a local church. Our next membership class is this Sunday, November 15, at 4:00 p.m.
Are you abiding in the Word daily? This is a habit God uses to shape us and encourage us. Are you part of a class, a group, or a study? Our growth to maturity in Christ almost always occurs in the context of relationship with other believers. Have you found your place to serve? To follow Christ means serving others his name. Are you going with the gospel? As we are learning as we read together through the book of Acts, part of God’s plan is for every follower of Christ to be a witness. Our next missions class is this Sunday at 4:00 p.m. as well. 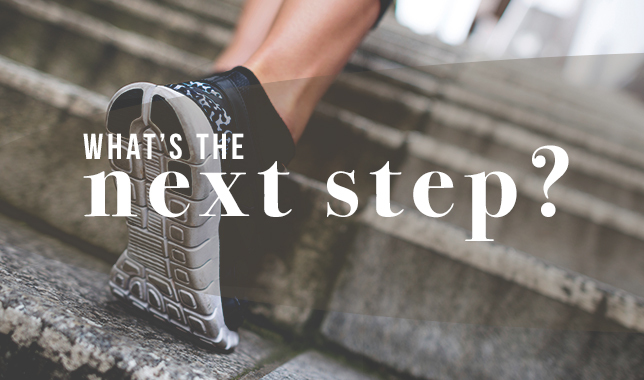 Whatever the next step is for you in your walk with Christ, our pastoral team is eager to help. Don’t settle for being stuck somewhere short of full devotion to Jesus. Take the next step now!